The Lastolite Brolly Grip Kit with 20" Umbrella is an effective diffusion solution for what Lastolite would call the "solo strobist." For the dexterous that means that you can handle your autofocus DSLR with one hand while effectively using your arm as a light stand for your umbrella. 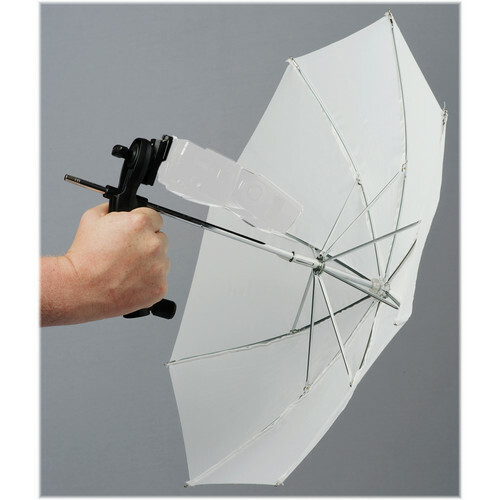 Lastolite makes it easy with the inclusion of a grip handle which alternatively mounts on a 5/8 (16 mm) stand stud as well as a 20" translucent umbrella. Just add your on-camera flash and shoot. Box Dimensions (LxWxH) 17.5 x 2.9 x 0.9"
Brolly Grip Kit with 20" Umbrella is rated 3.6 out of 5 by 16. Rated 2 out of 5 by David from Great Ideal but.. lacks a few features Great ideal but lacks a few features.. The only adjustment to be had on it is the rotation for the flash unit so you can rotate it for the Photo Eye to be towards the camera.. There is no adjustment for the angle of the umbrellas and No Screws to hold the umbrellas in place.. I am still in the testing phase of it.. and trying to rig to a light stand so I can tilt it to the right angle.. Rated 2 out of 5 by Skibby from Needs some improvements I use this product for off camera flash held by an assistant. On one hand I like the potential functionality of this product; on the other hand I am disappointed with the design and quality. Specifically, the grip is undersized for my hand and can be slippery making it difficult to hold onto. A larger grip with a rubberized coating would make it better. More importantly, the flash shoe does not grip my SB900 tight enough and it can slip out if you move the grip suddenly in the wrong direction. I have also had the included umbrella slip out of the grip. Because of its close proximity to my SB900 flash head, the framework for the umbrella gets hung up on my flash head when opening or closing. Rated 2 out of 5 by Cruising from Lastolite fell short on this product. I am a huge Lastolite fan - and on this product (the ONLY one I have found), they fell short. The SB900 barely fits and the umbrella is going to fall apart quickly. It also seems like wear will keep it from staying attached. Just not the quality I have experienced and come to expect from all their other products (and I have quite a few). Rated 4 out of 5 by Tracy in Texas from I would buy this again I really like the light from this modifier but it could use some changes. I had to turn the handle backwards to use with my off camera flash control because the controller was too long and it did not fit. Not a big deal but the handle is now backwards. It definitely needs something to hold the umbrella in place as the brolly grip tends to swing around the shaft of the umbrella. Overall I love it. You just have to figure out how to solve some of the issues. Once you do that it is great. Rated 4 out of 5 by John from Nice, but odd grip if you ask me I saw someone use this at an event, and immediately wanted one. They had an assistant hold it using an off-camera speelight as they went from table to table getting couples shots. The grip for thsi thing is at an angle where the bottom of it points toward the inside of the umbrella, and to me that is backwards. Apparently it is assumed the photographer is holding it in one hand and the camera in the other, and for that reason it is shaped that way so it can be held a little further away from the subject. I'm guessing. Or it could just be that way to distribute the weight of the flash more evenly. I haven't actually used it yet. I wasn't planning on holding it myself, rather I expected an assistant to do that. So I wish the grip was either turned the other way or better yet, had the ability to reverse direction. Rated 5 out of 5 by Tracy K. from The Ultimate in Portability! I'm new to off-camera lighting, so I may not have the perspective that working pros do, but for what it's worth, this long-time hobbyist LOVES this brolly grip! I needed something light and portable, and this fits the bill perfectly! I look forward to using it more, but here's a pic taken with it. Without the brolly grip, this couple would have been very dark. Rated 2 out of 5 by Richard F. from Short Shaft: Doesn't Work with PocketWizard The product works as long as you're only mounting a flash. Unfortunately, the shaft is too short to accommodate a PocketWizard radio or even a Nikon SC-17 TTL Coiled Remote Cord. I can deal with some of it's other faults (awkward grip, lack of adjustment, etc. ), but the short shaft is a deal breaker. I'm actively looking for an alternative product. Rated 3 out of 5 by Tennessee Rick from OK I was looking for a small umbrella to use with a handheld constant light. This is the smallest umbrella I could find. It comes with a nice carry case that I can strap to my camera bag strap. The grip is fine, but the umbrella already has one bent rib after only a week. I think I’m fairly easy on things, but this umbrella is simply not very durable.